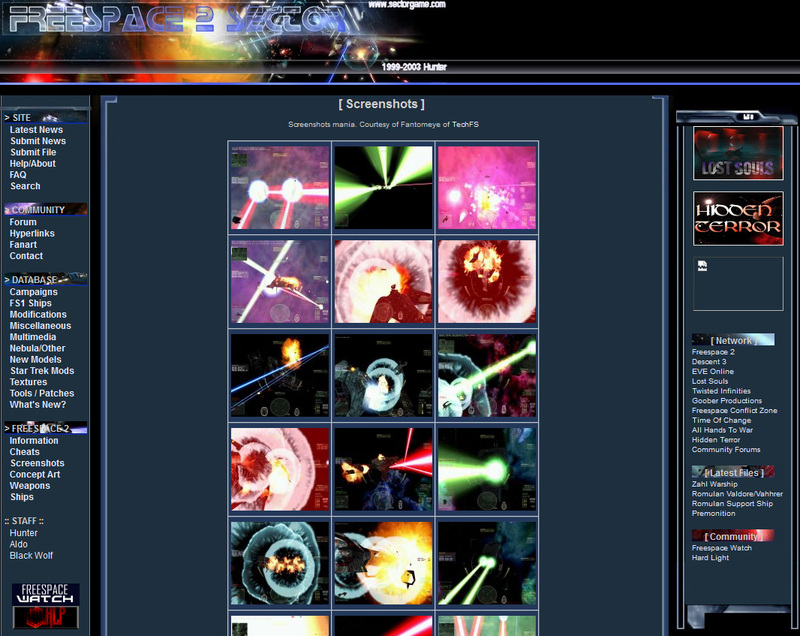 FreeSpace Files (originally known as FreeSpace 2 Sector between 1999-2014) is a mod repository for the game FreeSpace 2. 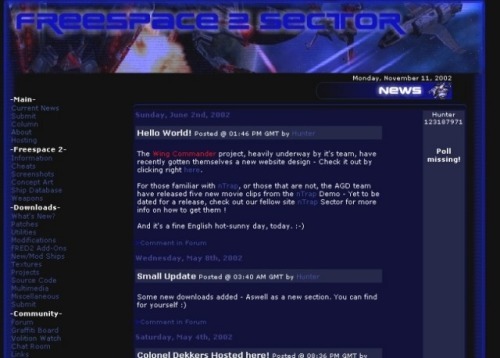 Since 2001 we have been part of a wider project (known as Sectorgame) to provide a community oriented service that includes the hosting of expansion projects and campaigns for the FreeSpace and Descent series. 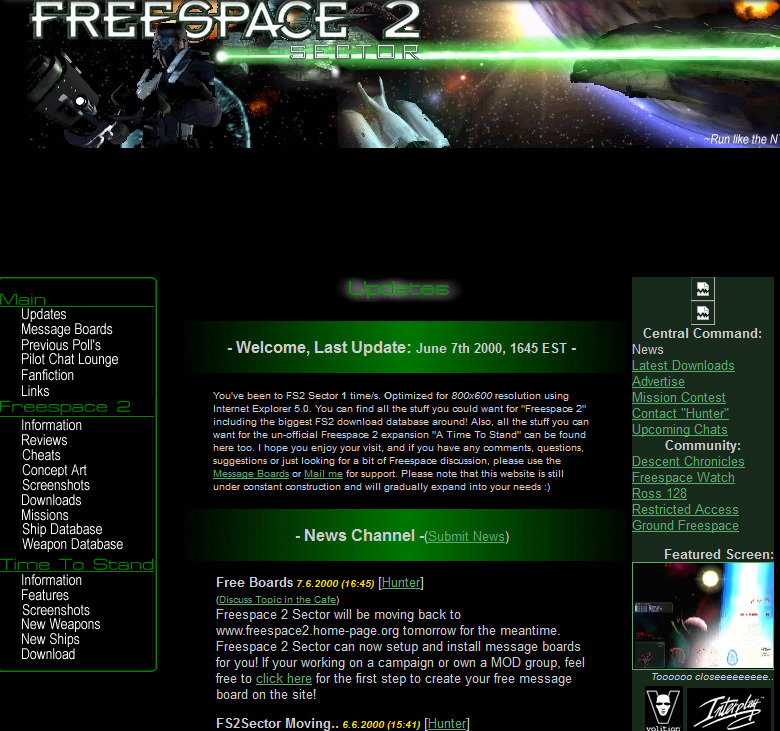 FreeSpace 2 Sector was launched in late 1999-early 2000. Over the years it has been hosted on various different servers (Compuserve, Geocities, Ross128, Freedom2Surf, HostGator, VPS and eventually our own Dedi) and seen four major re-designs. F2S was unfortunately left unattended for a few years, and it wasn't updated very often. The site had effectively died. So we (or I, Hunter...) decided to launch FreeSpace Files in it's place - a modern and quick way of obtaining and storing the files you need for your projects. For support with Freespace Files or general information, please read this forum thread. Alternatively, please use the uservoice app (bottom right) to report technical problems or broken links. Are you new to FreeSpace Open? click here to learn more. 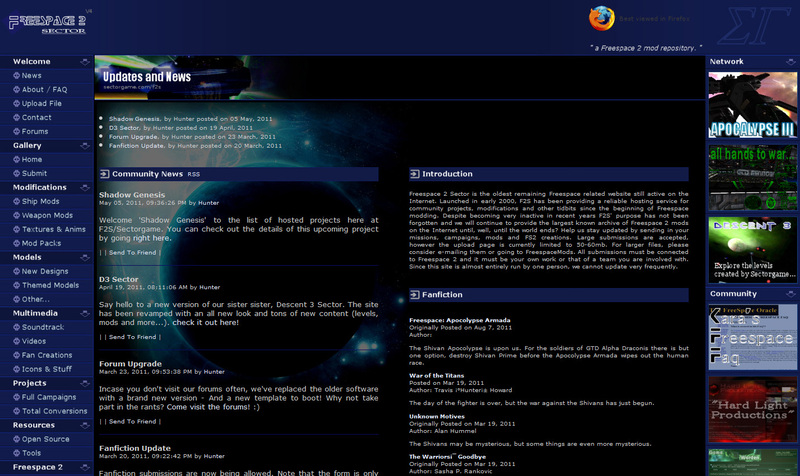 A complete overhaul of the backend has been performed. The most important addition is the global search function (accessible only from the navigation menu) which allows you to find files throughout the site, except for those within the private repos. Some other features are being worked on - for now let me know if you find any bugs. Download links have been reverted to the old system temporarily, BUT direct links will still work if you have those. A few much needed code updates have been applied and several bugs ironed out. Everything should be working properly. Direct linking has now been rolled out, but encrypted links will still work - if they don't, simply find the original file because the links won't be changing again this time! Old new features have returned. The private section of FreeSpace Files is now active again, and this time you can freely register and do your thing without having to ask first! All you need is a valid e-mail address to verify your account. Simply click 'My Repository' in the MENU to access the private section. All data uploaded to this section will be visible only to your account, unless you share files using the 'SHARE' option. Please remember, ONLY FreeSpace related content is allowed. An update! Yes, after a whole year the script has finally been updated. Sharing and group downloads should now work as intended. A few small code & template changes here and there. I've also removed the group login feature, as it was rarely used. I'll be moving all that data somewhere else perhaps? In other news, ALL previous links have been expired - you'll need to obtain the new URLs. Unfortunately I haven't found a way to restore them yet, but I'll look into it. Why hello there. This little box will contain notifications of small updates such as technical changes or new additions made to the site. Stay tuned! A single-player campaign with over 30 missions. New scenarios include flying with Vasudan squadrons, piloting advanced stealth fighters, and "painting" targets with TAG (Target Acquisition & Guidance) missiles. Command up to eleven squadmates in battle. Order them to defend, attack, disarm or disable your target. An in-depth combat system enables players to target and destroy subsystems, disabling engines, defensive turrets, missile batteries, and fighterbays. Armed with cutting-edge weaponry, new fighters and bombers hurl the player into complex, fast-paced WWII-style dogfights. With over 80 turrets, Juggernauts span six kilometers from bow to stern and are virtually indestructible. Stealth fighters are engineered to minimize their EM signatures, rendering them invisible to sensors except at very close range. AWACS enable allied ships to target hostiles in the volatile environment of the nebula. Gas miners gather deuterium-rich nebular gas to fuel fusion-powered vessels. An innovative and immersive nebula environment changes gameplay dynamics. Impaired visibility, communications, and targeting ability create opportunities for ambush and new combat tactics. Up to 12 players can battle in dogfight, team vs. team (8 players max. ), and cooperative missions via LAN, TCP/IP, and modem. From the time it became apparent that there would be no FS3 the most repeated complaint the community had was that Volition wouldn't release the source code so that the community could work on it themselves. However, Volition did release the source code and many of those within the community with programming experience got to work on it. The result was FS2_open. The project to make FS2_open has come to be known (originally enough) as the Source Code Project (SCP). FS2_open is not FS3. Instead it is a enhancement of the original Freespace 2 engine. The idea is that by running FS2_open you can play the Freespace 2 main campaign and all the Freespace 2 mods with better graphics, augmented AI and better mod support. In addition to this improvements have been made to several of the games basics to add new kinds of weapons and missions that couldn't be done before. These effects won't show up in the main campaign but will show up when special "Made for SCP" mods begin to appear. The differences between FS2 retail and FS2_open are fairly extensive. Some think it is almost like playing a new game. The Galactic Terran-Vasudan Alliance (GTVA) was formed in 2345, ten years after the Great War. This treaty organization recognized the autonomy of its constituents as it provided a framework for trade and mutual defense. The Great War had transformed the enmity between Terrans and Vasudans into a lasting fellowship. As the industry and economy of the Terran-Vasudan systems recovered, support for a more powerful GTVA gained momentum. In 2358, delegates signed into existence the Beta Aquilae Convention (BETAC), named after the system where the constitution was drafted and ratified. BETAC dismantled the governments of the Terran blocs and recognized the General Assembly, the Security Council, and the Vasudan Imperium as the supreme authorities of Terran-Vasudan space. Under BETAC, the Vasudans and the Terrans maintain separate fleets under a single command structure. A warship is designated GT or GV, indicating whether it is Galactic Terran or Galactic Vasudan. The two species openly exchange information and technology, and the most recent fighters and bombers can be modified to accommodate pilots of either species. Technically, BETAC is but one of a series of conventions and treaties that define how the GTVA functions as a political, military, and economic entity. However, the significance of BETAC as the cornerstone of the Terran-Vasudan alliance has made it the favored target of NTF propagandists. In 2335, the destruction of the Lucifer superdestroyer collapsed the Sol jump node in Delta Serpentis, severing all contact with Earth. The fate of the Terran home planet remains open to speculation, though a number of scenarios are possible. As the center of an interstellar community, Earth could not survive in isolation without a radical transformation of its political and economic structures. On this point, there is no disagreement. However, the question remains whether this transition occurred peacefully or whether Terran society collapsed into anarchy. Strong arguments have been advanced for both sides. For generations, Earth had been the political, economic, and cultural center of Terran civilization. Humans still measured time in hours, days, months, and years. They named their ships after the mythological figures of ancient Terran civilizations, and systems were still identified according to the constellations observed from Earth. The planet served as capital of the GTA, and the bulk of the Terran industrial base was located in the Sol system. Offworlders identified their nationality according to the old Earth boundaries, though nation-states dissolved after the discovery of subspace and the emergence of an interstellar Terran society. Though necessity has diminished Earth's practical importance in the post-war era, discovering the means to return home remains a high priority. The Vasudans are a civilization of philosophers, artists, and scholars. They immerse themselves in the teachings of those who came before them, perceiving history not as a linear chronology of events but as a space inhabited by both the living and the dead. To the Terran outsider, Vasudan society appears convoluted and ritualistic. The Vasudans themselves may seem arrogant, treacherous, and superstitious. On the other hand, Vasudans tend to view Terrans as aggressive, paranoid, and stupid. Thirty years of peaceful interaction between Terrans and Vasudans has helped to deconstruct these stereotypes. The crowning achievement of the Vasudan civilization is its language. For the average Terran, the formalities governing its usage are beyond comprehension. Syntax and vocabulary are dictated by such factors as the speaker's age, rank, and caste, the time of day and the phase of the Vasudan calendar, and the relative spatial position of the speaker to the Emperor. This is further compounded by the existence of several alphabets, dozens of verb tenses, and thousands of dialects. A translation device is standard on all GTVA communications systems, enabling Terrans and Vasudans to understand each other. 32 years after the Great War, we still know almost nothing about the Shivans. Physically, the Shivans have multiple, compound eyes and five legs with claw-like manipulators. Their insect-like carapace does not appear original to the creature's physiognomy, suggesting the Shivans are a cybernetic fusion of biology and technology. The integrated plasma weapon also exhibits properties of an organic-artificial fusion. The weapon may be a kind of focusing device powered by the energy of the being itself, though this point is the subject of heated controversy. These details are cited as evidence that the Shivans could not have evolved as the Terran or Vasudan species had, but that they were likely constructed by another entity. Only a handful of Shivans have ever been captured, and all research on live specimens ended with the GTI's Hades rebellion in 2335. The results of these studies remain highly classified. Though the Shivans are obviously xenocidal, their motives and origins have yet to be determined. According to Ancient artifacts, the Shivans seem to possess some kind of sensitivity to subspace disturbances. We do not know if the Shivans returned to this corner of the galaxy by chance, by cycle or pattern, or by their detection of Terran-Vasudan subspace travel. To active cheat codes you must type www.freespace2.com during game. Note that you cannot progress through a campaign after activating cheats. toggles countermeasures on all ships. does ~10% damage to your target. does ~10% damage to yourself. gives the player infinite weapons. gives all ships infinite weapons. Call in the Volition pirate ship! Enter at Vasudan main hall. FISH TANK! Enter at Vasudan main hall. Ugh! To active cheat codes you must type www.volition-inc.com during game. Note that you cannot progress through a campaign after activating cheats. marks all primary goals complete. marks all secondary goals complete. marks all bonus goals complete. requests rearm for target/player (if no target selected). scrolls forwards through all secondary weapons. scrolls backwards through all secondary weapons. scrolls forwards through all primary weapons. scrolls backwards through all primary weapons. You can upload files to any folder, but folder creation and file deletion is restricted. You don't need to login to download files. You can download from anywhere including hotlinks. Images can only be hotlink-displayed by using the cached URL, not the download URL. Audio files (.mp3 or .wav) will be streamed when clicked. Use right click to save them. Use the small Windows-like icon to switch to gallery mode when viewing images. Usage is unlimited. There are no restrictions, but only Freespace related content is allowed. Please upload files to the correct folders. If unsure, upload to Work-in-Progress or Uploads folders. There is no maximum file size, but if any single file exceeds 500MB we recommend using split archives. Grouped downloads cannot exceed 256MB or 100 files. Uploads are instant and subject to review at a later time. Abuse of server resources is subject to moderation and possible bans. Welcome to FreeSpace Files. This site contains all of the mods that were previously available on FreeSpace 2 Sector, along with a large majority of the new content available. To upload files, simply login as 'freespace/files' (lower case) For support or queries just click on the small question mark at the lower right side of the page. To search the site, use the top menu. WARNING: Do not use HTTPS links for the installer! FreeSpace Files © 2014-2019 Sectorgame.com FreeSpace® is a registered trademarks of Interplay Productions© and Volition© Inc. All rights reserved.